To further build confidence in your drawing skills there are a number of 'loosening' exercises that can be easily tried alone or in a group. The purpose of these exercises is to free up the artist so that elements, subconscious creativity and 'chance' can shine through. In this way you will learn to make bolder statements, unrestricted by the niggling voice of judgement that often restricts the your freedom of expression. There is a school of thought that argues that learning to draw and paint in a tight and methodical way should be the way forward above all else. However, even a methodical approach to accurate drawing and painting requires a relaxed and risk-taking approach. This really shows in the work of the Master painters in comparison to their lesser contemporaries: see, for example, Michelangelo, Titian, Rubens, Velazquez and Rembrandt. In all of these painters there is an underlying boldness of approach, which is sometimes referred to as 'gesture'. Gesture is also used to refer to a form of life drawing that focuses upon 'movement' and the passing of time by the repeated drawing of a model in a series of short poses. The result is often a high energy finished picture with traces both of the movement of the model and the intense activity undertaken by the artist. It is this sort of vigorous practice, whereby the artist and the object, or person that they wish to convey jointly appear on the page that often marks the best drawing and painting. The key here is to imagine that an artwork is neither a scientifically rendered perfect copy of the object, or a pure outpouring of the artists feeling, but an agreement contrived between both the object and the artist, and committed to paper in the form of an image. Here are two goods ways to develop 'gestural' technique. In town on a busy day, try drawing a series of 5 minute sketches of one changing street scene. For this exercise, pick an area that is busy with passers by, workers and traffic. Obviously, try to pick a scene with a good focal point: i.e. a clock tower, tree, Church or Railway Station. When drawing this scene plot out not only the obvious main architectural features, but also the way these features relate to their surroundings, and the way in which movement leaves its mark on these features. You will notice that everything ultimately exists in relation to other things in its environment. You will also notice that everything is ultimately transitory in nature, meaning that what one moment seems vital to draw may in the next moment have changed form or have gone completely from view. This fact requires both judgement and flexibility. The artist must enter a relationship with the scene they are depicting. It may be that you choose to leave in one element of the picture, whilst removing others. The final result may not completely accurately depict a series of events, or be entirely true to form, but it will be true to the relationship between the artist and their environment. This is a lesson well learned as all life is experienced as a relationship between the individual and their environment. As such, ultimate control can never be gained by the artist, but rather, they must convey the experience of nature in tandem with nature. Working to music was a practice favoured by Spanish Surrealist-era artist Paul Klee (1893-1983). It enables one to add one more element to their work, and whilst depicting a scene, still life or portrait, also respond to the movement of the piece in question. Classical music is ideal for this, even if you usually find it to be bombastic and old fashioned! The dramatic nature of classical music allows one to be taken away in imagining the scene you are depicting being packed with intensity. Whilst drawing your chosen subject, invest it with the feelings that the music inspires, whilst staying true to both yourself and the subject. This exercise draws a constellation between three elements; the artist, the music and the subject that is drawn. In doing this you will become aware of the huge range of subtle influences that come into play when we make art. If you let yourself be guided by these influences surprising gestural patterns can emerge. You will see that reality is not just a series of impressions that fall upon the eye and brain as you perceive on object, but is forever adjusted by other environmental factors (such as noise, or music). 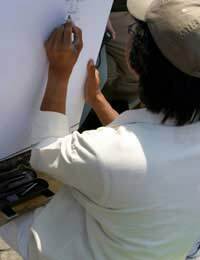 For this exercise try a large sheet of paper (A2 or A1, for example) mounted on a drawing board (see related article for advice on this). The object of both of these exercises is to loosen the control the developing artist often tries to gain over their subject matter, thereby teaching that in so doing a more accurate representation of 'reality' can be achieved.